The programme is a 6-month intervention, with weekly group sessions for participants aged between 12 to 17 years who have been assessed as being vulnerable to child sexual exploitation. It features experiential activities and challenges to positively engage the young people, and a residential at Brathay Hall in month 4 to consolidate learning and increase outcomes. a greater feeling of being in control. 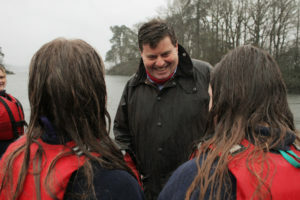 Speaking of his visit on 14 February Peter McCall said: “I was really impressed with the youngsters I met at Brathay Hall, and very interested to hear about the programme and what it is achieving for them. Tackling CSE is high up on my list of priorities, which is why I was happy to provide funding for this innovative programme. Any initiative that helps our youngsters to stay safe is to be welcomed. Jacqueline Wallace, Brathay’s Cumbria Projects Manager, said the charity was very grateful for the funding and for news that the programme has been extended for a further yearShe said: “So far 28 girls have completed our ‘Be SAVY’ courses. As a result of that 82% said they were more able to recognise a healthy relationship and 88% felt they had a greater ability to sort out problems they might face” explained Jacqueline. “This included one young person who had a difficult relationship with her mum, went missing at nights, was known to the police, and was drinking and taking legal highs at weekends. She was getting into fights, into trouble at school, and once stayed over at the house of an older man she didn’t know. We were able to support her to see herself differently, and to make choices which showed how much she valued herself. Her relationship with her mum improved and, although she was still getting into trouble at school, she was also able to recognise the value of working hard to get the grades she wanted for her future. She is now accessing further support.In addition, and on the back of the success of their CSE prevention work in Cumbria, Brathay have secured three year’s funding to expand the programme into North Lancashire.